Big Brother announced this week's theme to be Silent Movies. For the presentation housemates had to be divided into two groups and Biggie explained how this division would be established. He told housemates that his ninja would come in and hold a white square with several sticks inserted in it, with the coloured tip visible. Each housemate would select a stick one at a time and retrieve it from the square. Housemates would then be teamed up according to the colours of the sticks they selected. The ninja came and the housemates were divided. After the team selection was completed, housemates collected writing material and equipment from the storeroom. These items were to be used to pen the silent movie screen play. Biggie added that during Wednesday's presentation, a 30 second Ghandour Cosmetics advert had to be presented halfway through each silent movie. At an opportune time, Big Brother said that he provide housemates with Ghandour Cosmetics Baners, posters and products which would all have to be used in the advert. The advert was instructed to be both humourous and informative. 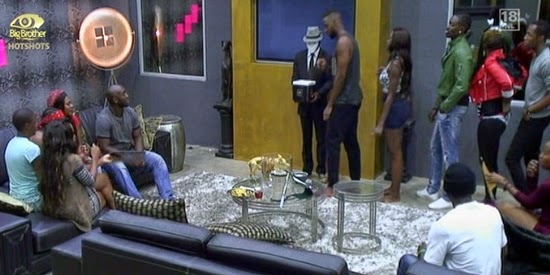 Along with the banners and cosmetics, Biggie said that he would provide a Ghandour information pack which would assist housemates with the conceptualisation of the 30 second advert. Housemates soon got to work after the two teams were distinguished and when the material and equipment had been collected. Housemates appeared to be serious about their new task and whist they worked, Sheillah went off to cook. Do you think the housemates are on their way to a 100% wager win?